You know the damaging effects of stress both to mind and body. 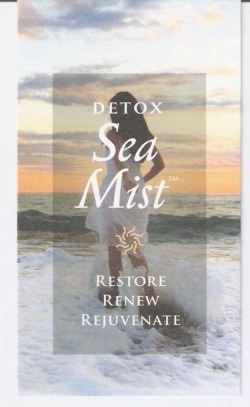 Use SeaMistDetox Bath, to simply let stress go down the drain. You may feel more relaxed in both mind and body. Lavender oil stimulates new cell growth. It lifts depression, calms nerves and promotes nerve health. Lavender oil fights infection, reduces inflammation and eases congestion. It relieves pain and muscle spasms. Lavender oil lowers blood pressure. Soak 25 minutes in warm water, rinse, and enjoy the effects of renewal. Give yourself the gift of Spa Renewal with SeaMist bath soak from Pinson Cosmetics. 3/pkgs. includes gift wrap. Use one package per tub bath. Shipping costs within the USA are $10.95 for a package of 3-10 units. For larger quantities call /email for exact shipping amounts to your location. Yes we have PayPal for tax and shipping. Shipping and tax may be charged securely on our shopping page by check GREEN Pay, Paypal, or by credit card by phone. Within USA Priority =$9 for 2 units. Flat Rate Large box for up to 20 units =$15.95.